If you need a electric hot water system repaired or replaced despite the fact that it’s 2 o’clock on Sunday morning, you need to contact Metropolitan Plumbing. With availability spanning all 24 hours of all 7 days per week, and the resources to have an extensively trained, licensed plumber to your door within the hour*, there’s no other option worthwhile. Call us now, or else fill out our simple online booing form. With electricity costs always rising, as well as their substantially negative impact on the environment, electric hot water systems are falling further and further out of favour. However, some manufacturers these days are devoting money and time to the design and production of high-efficiency models of electric hot water systems, and there are certain things you can do, such as choosing the right tariff, to decrease these concerns. If you need to have a new electric hot water heater installed and you want to talk through all of these things with a hot water systems expert, contact Metropolitan Plumbing. We’re happy to help you make the right choice, then retrieve and install your desired appliance. We can also repair your faulty electric hot water system, so we’ve got you covered for any situation. 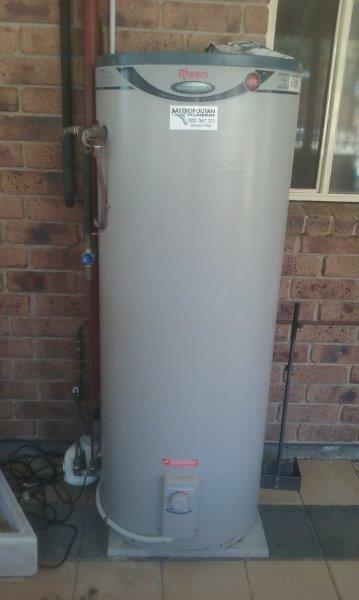 #1 Electric hot water system experts in Adelaide, Melbourne, Perth, Sydney & Brisbane. My electric hot water system died. Will you be able to repair it? The hot water system is one of the things you never want to start malfunctioning, so it’s incredibly frustrating and annoying when it does. Here at Metropolitan Plumbing, our hot water systems experts understand this full well, which is why they’ve all undergone the most comprehensive training and experience possible to make sure they’re ready for any and all repairs you need done to your electric hot water heater. Not only that, but they also have a huge selection of spare parts stocked in their vans at all times, making all those electric hot water repair jobs much quicker and cheaper while taking the stress of you. Available in both storage and continuous flow models, electric hot water systems use an electric element to generate the heat that’s transferred into your water supply. This is a very complicated appliance, and is potentially dangerous if somebody who doesn’t know what they’re doing attempts to work on it. Don’t take that risk. Contact Metropolitan Plumbing as soon as the problem arises, and we know how one of our hot water professionals around to your home or business straight away to do those repairs for you. No matter what brand of electric water heater you’ve got, we have the skills, experience, know-how, tools and parts to have it back up and running in no time at all. What happens of you can’t repair my electric hot water system? Repairing a hot water system is always the most desirable option, but if your existing electric hot water system can’t be fixed we’ll need to replace it with a new one. If this is the case, your attending Metropolitan Plumber will be able to discuss your options with you so you know exactly what your options are, and then retrieve and install your choice of hot water system on the same day. Our plumbers are skilled and experienced with installing all makes and models of electric hot water heater, so we can replace your old one with any new appliance you want. The same goes for switching to an electric hot water boiler. For those people requiring hot water system installations or replacements in Adelaide, though, this won’t be possible with an electric water heater. Government regulations state that, unless you fall into one of the excepted circumstances, new electric hot water systems are unable to be installed since they’re considered to be too inefficient and unsustainable. If you live or work in Adelaide and need a new hot water system, your attending Metropolitan Plumber will only be able to install a gas, heat pump or solar unit. We can still do this quickly and easily, so contact us now.